Shopping for clothes is always going to be a nightmare when you’re short. Even though I’m 5’4″, some may consider it as short whilst others may consider it as average depending on whereabouts in the world you are. Pretty sure the UK average height for women is taller than me. Here I list some frustrations I have found with clothing which some of you could probably relate to. Minis are knee length, midis are maxis to us, whereas maxis leave a trail. Even heels doesn’t make a difference for the latter and would still fall over. Like the image above – I ended up returning the skirt and wrote a small note asking them to consider releasing a petite range. Worth a shot! If a dress is too long and I love it too much to not return it, I always have to spend extra to get it shortened. They’re not proportionally made to fit us. Long length, crotch not right, waist is where now? Just nope. Every pair of jeans I had purchased whilst growing up were always too long. Even when I roll them up, they always somehow unravel and end up getting ripped, drenched and trip over them. I avoid bootcut jeans for this particular reason. Especially with some capris. They end up being the perfect leg length. They’re either above or way below the waist, never in the right place. Thanks short torso. All of my workout leggings bunch up around the ankle. Pulling them up to even it out doesn’t work. There’s small wrinkles along the leg. I’ve got a few boyfriend jeans, baggy trousers and they make me look shorter than I really am. I guess if they were high waisted then it kind of makes up for it. Ish. Wide leg trousers are also a no go. All of the models are tall, 5’8″ on average, and it’s hard to see how the store’s clothing will fit on a shortie. I instantly know they’re going to be long on me. They look like tunics or can probably pull off wearing it as a dress. Can be a good and bad thing. Do you have any issues with your height? I FEEL THIS SO MUCH. I'm 5ft 1 and struggle so much to find well fitting clothes if there isn't a petite range. Jeans are the big one – I'm too lazy to properly take mine up so end up just rolling them up instead! I'm the complete opposite though, things are always too short haha! I'm not short so I don't face these issues, but they really are quite annoying issues to have to deal with. My mummy would love to be able to get away with wearing a jumpsuit, unfortunately she's too curvy to get away with it! 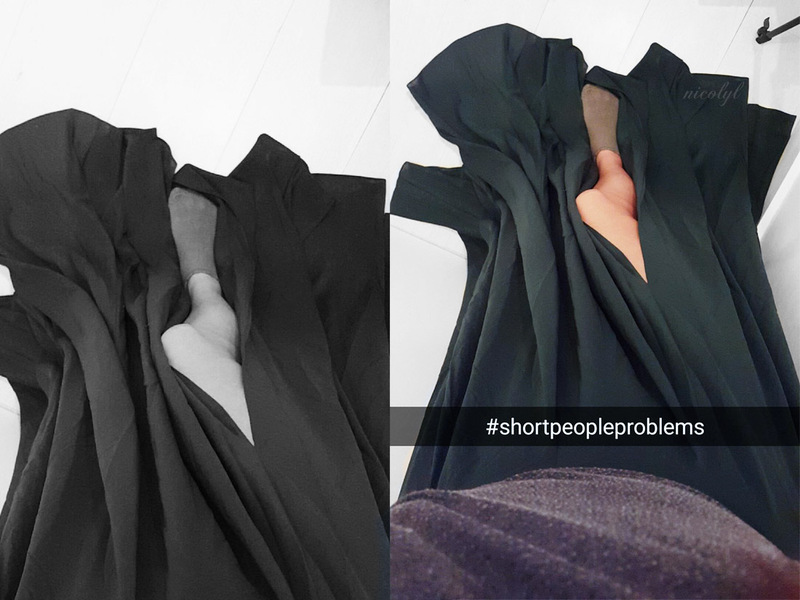 I'm lucky as most times everything fits length wise but I can imagine that it can be annoying when clothes are too long. Lol I hear you although for me I have strange proportions. I am 5ft 4 and a half but have the legs of a giraffe. But I am also slim so often trousers in my size or even dresses end up looking too short and I look like I have ankle swingers. In some cases though things can be too long and I have to wear massive heels lol. I have a friend who is petite like you and she has the same struggles. There needs to be more options for short women —- and men! My mum is quite small and has some of these problems too. Hahaha! I'm 5"5 and TOTALLY get this. My husband laughs at me all the time!